Well-informed, experienced global buyers have come to expect convenience, practicality and wide-ranging exhibits from the organizers of trade fairs related to automotive products, powered-two-wheelers (PTW) and electric vehicles (EVs) in Taipei. This year's 4-in-1 platform is a 4-day event to include the 2016 Taipei Int'l Auto Parts & Accessories Show (TAIPEI AMPA), International Automobile Electronics Show (AutoTronics Taipei), Taiwan International Motorcycle Industry Show (Motorcycle Taiwan), and Taiwan Int'l Electric Vehicle Show (EV Taiwan), to be held at the Taipei World Trade Center Nangang Exhibition Hall (in suburban Taipei) and Exhibition Hall 1 (Shinyi Rd. near the TAITRA headquarters in Taipei) April 6-9, 2015. The show organizer Taiwan External Trade Development Council (TAITRA) says the event is the only specialized exhibition platform for two-wheeled and four-wheeled vehicles held in Asia. Boasting more than 4,000 booths and expected to attract 8,000 buyers from 130 countries, the 4-in-1 mega show promises to be Asia's most comprehensive automotive trade show. After years of effort, the auto parts and accessory industry in Taiwan has transformed from an OEM-oriented industry to one that can now claim to have design and development capability. Standards of product safety, qualitative stability and innovation are generally recognized as relatively high among renowned international companies, with exports having been growing steadily. Data from the Taiwan Transportation Vehicle Manufacturers' Association, or TTVMA, show Taiwan's auto parts exports totaled NT$207.7 billion (US$6.93 billion) in 2014, up 4.96 percent from the previous year. In the first eight months of 2015 exports hit NT$142.14 billion (US$4.44 billion), a 3.06 percent increase from the same period of 2014. TAITRA says that in 2016 TAIPEI AMPA will enter its 32nd session, with all major manufacturers having registered to attend. The number of manufacturers and exhibition booths are expected to grow more than 5 percent, a testament to the growth of Taipei AMPA and Taiwan's automotive parts and accessory industry. 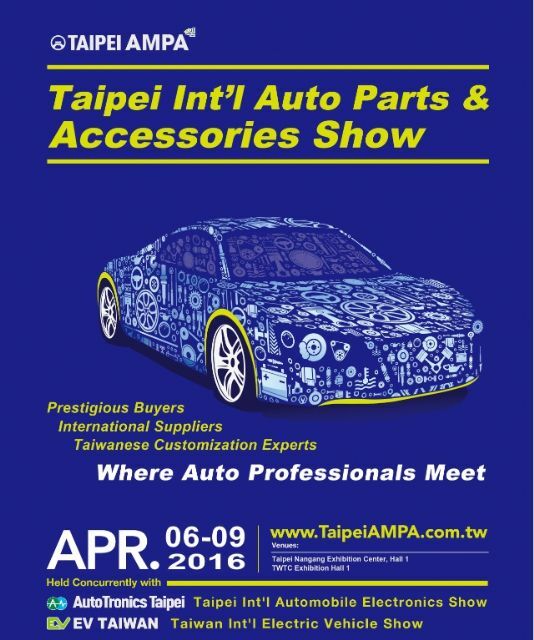 The organizer adds that as Asia's premier sourcing fair for auto parts and accessories, the 2016 Taipei AMPA will, especially among first-time exhibitors, buyers and visitors, help to make sourcing a convenient rather than taxing experience, by offering machinery, molds, sheet metal, tires, lighting to automotive multimedia and ICs and in-vehicle computer products from 1,100 firms specializing in wide ranging items. Renowned for Taiwanese suppliers' customized products and services, as well as the island's information and communication technology (ICT) advances, TAIPEI AMPA continues to be the best one-stop sourcing platform in Asia. Also the show will see upscale Asian suppliers from China and Thailand organized in group pavilions and individual exhibitors from Hong Kong, Malaysia and Indonesia. The organizer also expects to invite to the event 40,000 international corporate CEOs and purchasing managers from numerous global heavyweight aftermarket automotive distributors. To upgrade the show's level of specialization, TAIPEI AMPA will have a brand new exhibit area, “Tire & Rim,” to highlight the sector and create business opportunities by inviting the biggest tires and rims manufactures as exhibitors in 2016. 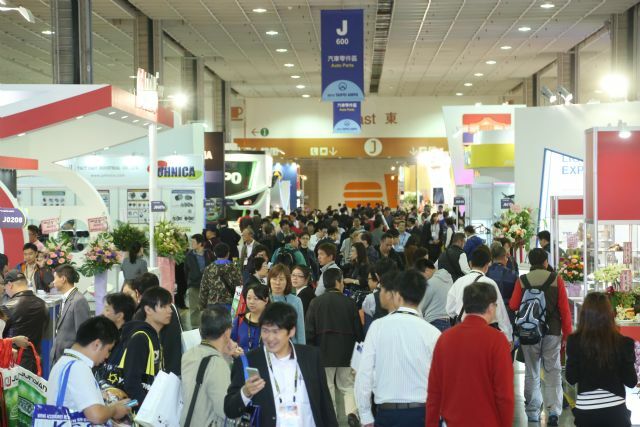 TAITRA says several famous tire manufacturers in Taiwan show interest as exhibitors, such as Nankang Rubber Tire, Goodtire Rubber Industrial Corporation and Unilli Motor, etc., which will better differentiate and specialize the trade fair. 2016 TAIPEI AMPA, AutoTronics Taipei, Motorcycle Taiwan and EV Taiwan make for a 4-in-1 platform to start on April 6 in Taiwan. A number of auto-related shows have been organized in recent years in response to rising adoption of electronics in auto parts and accessories, growth of digitization in the PTW and automotive industry, and growing emphasis on carbon reduction, including AutoTronics Taipei, Motorcycle Taiwan, and EV Taiwan. Together, these shows are a positive indication of the comprehensive capability of the automotive and PTW supply chain in Taiwan, to be a one-stop sourcing platform for foreign buyers.